A published report out of Vietnam on Thursday reveals the sharpest image to date of the BlackBerry A10. According to the source, who obviously got a chance to handle the phone, the frame around the border is metal. While the battery cover can be removed, the battery itself is held in place and the overall finish and quality of the phone is good. The "most prominent" part of the device is said to be the 5 inch screen, which makes this the first 'Berry smartphone with a screen that hits the 5 inch mark. Earlier this month, we showed you what looked to be a genuine BlackBerry confidential document with the specs of the A10 listed. The report Thursday from Vietnam matches those specs to a 'T'. We're talking about a 5 inch AMOLED screen with resolution of 720 x 1280, a dual-core 1.7GHz Qualcomm Snapdragon processor MSM8960, 2GB of RAM and 16GB of native storage. The BlackBerry A10 will be powered by a 2800mAh battery and will have both a micro USB and micro HDMI port available. Back and front cameras weigh in at 8MP and 2MP respectively. The device is 9.4mm thick and has BlackBerry 10.2 installed which means that it will run many Android Jelly Bean apps. We have a very nice collection of sharp, clear photos of the BlackBerry A10 followed by a video. If you've been thinking about the phone replacing your current handset, or if you're just plain curious, you are going to want to see the A10 like you haven't seen it before. We should point out that this model has the AT&T brand on it. We've also seen leaked photos of the A10 carrying the Verizon logo. And it appears that this handset will be available in black or white. Enjoy! I cannot lie. So far (without watching video) it looks d@#m right gorgeous. From a build/design perspective. is that Z10 or the HTC one? I hope they get this out before the rumored November release. 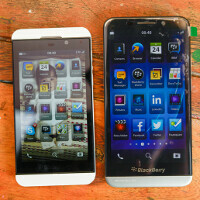 I like my Z10 but I need to see good results from BlackBerry this quarter before I buy an A10. Otherwise I will be looking at the rumored 6 inch HTC One variant or the current 64 GB version. Looks like a very nice phone. The fact that it can run android apps is great for the end user but will it help Blackberry's bottom line? Yep, I agree with you. Support is a big "if", and I am not sure I want to live through that again like I have with WP who is just now catching up. But, man that OS is a blast to use. I hope it catches on. I may be a convert if I think i is a OS wih a future. I didn't liked the back cover while front is just awesome. I don't think this will be the a10 'aristo' everybody seems to be going on about. Apart from having a larger screen, the specs of this phone are too close to the z10. The back of the phone even states a 'Z' designation for this phone! (Z00). If, however, I am wrong and this is actually the new flagship, then I worry for Blackberry. This phone is already behind the curve compared to the hardware available on other smartphones, and its not even been officially announced yet!